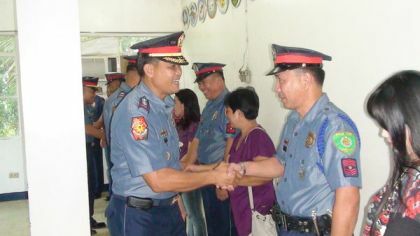 SAN JOSE, Antique Jan 5 (PIA) -– The Antique Police Provincial Office (APPO) committed to intensify its campaign against criminality as they welcomed 2012 with optimism of building strong partnership with the community and multi-sectoral groups. "We need to enhance our partnership with community, agencies of government, non-government organizations and local government units in stepping up our campaign against criminality and maintenance of peace and order," PSupt. Jose Roy Torrechilla said. With Police Integrated Patrol System (PIPS), Torrechilla said it is their goal to lower the crime rate this year. The 18 Municipal Police Stations and two mobile groups are coherent in its mission to ensure lawless elements are apprehended and possible intrusion to peace and order are averted, said Torrechilla. PNP also enjoined the support of Barangay Peacekeeping Action Teams in 590 local communities to help police officers maintain peace and order in their barangay. Barangay Tanod as force multipliers can do a lot, including disaster response and in emergencies. In addition, the PNP has designated Police Officer (supervisor) in every barangay as link of the PNP to the people at the same time enhance police relations and serve as accountable officer in terms of peace and order. This is one of the priority thrust of PNP under Police Director General Nicanor A. Bartolome.